Although diving is possible year round the best time is March to August when the sea is calm and visibility is good, between 20-35m. In the off season visibility can drop to 10m. Grouper Patch is, surprise surprise, a patch reef with large groupers in residence. The hard coral reef is also home to schools of snapper and fusilier among other reef fish. Sunday Reef is a small reef with many anemones full of clownfish. Nudibranchs are numerous. Over 70 different species have been recorded in the area. 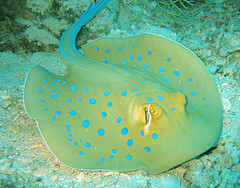 Blue spotted stingrays can be found in the sand here, as they can on most Miri dive sites. Santak Point is a popular reef for photographers because the visibility is usually excellent and large gorgonian seafans sway gently in the current. The same is true of Batu Belais and Seafan Garden where schools of batfish make easy photo subjects as they follow you around the dive site. Anemone Garden is one of the prettiest dive sites with a mix of hard and soft corals, seafan and anemones. Common fish include lionfish, trumpet fish and moray eels. Tukau Drop Off is a slightly deeper dive. The wall drops to 40m. Currents can be strong here. Schools of barracuda and trevally are common. Napoleon wrasse and reef sharks can also be seen. Atago Maru Wreck to the north of Miri is a 100m long Japanese WWII wreck that is covered in encrusting coral and sponge. Visibility can be low. Barracuda and trevally hunt the smaller fish over the wreck and a giant grouper has made it’s home in the hull.